Las Vegas – UFC lightweight champion Khabib Nurmagomedov will defend his title against former two-division champ and No.1 contender Conor McGregor in the most anticipated fight in the promotion’s history. The co-main event will see a battle between heavyweight KO artists, as No.2-ranked contender Derrick Lewis will lock horns with No.5-ranked Alexander Volkov. 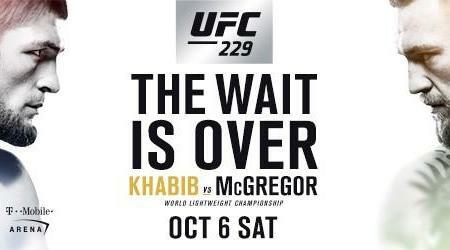 UFC 229 takes place Saturday, Oct. 6 from T-Mobile Arena and will air live on Pay-Per-View. Known for his crushing pressure and ground game, the undefeated Nurmagomedov has proven to be unstoppable inside the Octagon. Over the course of his spectacular run, he’s earned dominant wins over Edson Barboza, Michael Johnson, Rafael Dos Anjos, Abel Trujillo and Thiago Tavares. Nurmagomedov’s last outing saw him best Al Iaquinta to capture the lightweight championship. He now looks to earn his first successful title defense in a grudge match for the ages. McGregor looks to reclaim his belt against his most heated rival yet. The bout marks his return from competing against Floyd Mayweather in the biggest global boxing match ever seen on Pay-Per-View. In the Octagon, he’s delivered incredible victories against Nate Diaz, Jose Aldo, Chad Mendes, Dustin Poirier and Max Holloway. He became a two-division champion by knocking out Eddie Alvarez in 2016, and he now aims to take his top spot back against his toughest test to date. Heavy-handed Lewis looks to stake his claim for a title shot with another vicious finish. During his UFC stint, “The Black Beast” has earned impressive finishes against Marcin Tybura, Travis Browne and Gabriel Gonzaga. His last outing saw him earn a decision win over recent title challenger Francis Ngannou. He is now primed to put away another surging contender. A champion outside the UFC, Volkov is currently riding an impressive six-fight win streak. Following victories against Stefan Struve, Roy Nelson and Timothy Johnson, the Russian standout netted a spectacular KO win over former champ Fabricio Werdum in March. Volkov is now ready to deliver a show-stealing performance to earn a UFC title shot. at 6:30 p.m. ET/3:30 p.m. PT. Doors open at 5:30 p.m. ET/2:30 p.m. PT.